Today I had a breakthrough in my thinking that I wanted to share with you. I learned the true value of being part of a network of like-minded people of a shared interest, in this case property development. We are all bombarded every day with social media hype – and of course the likes of twitter and facebook allow us to connect and interact with many more people which is amazing. However we need to remember that it is not about technology it is about people and always has been. Communities both on and off-line are where we can find support and answers for any problem no matter how big or small… and mine was quite a big one! I am a member of the Property Tribes Forum , a very busy landlord and investor community. Today I was having a coffee with another member and asked her for input to my dilemma. She did not know the answer… but she knew someone from her network that did. His name was Phil Stewardson, a fellow developer based in the West Midlands. My friend was able to get Phil on the phone straight away and he gave us some extremely helpful input which could potentially solve my quandary. 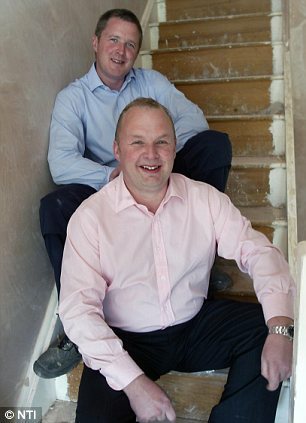 Photo caption: Phil Stewardson (front) and his brother, Mark. I would just like to acknowledge Phil and thank him for his kind input and hope I can return the favour one day. So what I have learned is that being connected to one person actually makes me connected to everyone that they know and everybody that they know knows! Surely this is the “purest” value of social media and is nothing new. Humans have been sharing good information and good people since time began – but thanks to the web – we can now do it on a much bigger and much quicker scale. We can tap in to a hive mind of knowledge and contacts that can help us and ignite serendipity along the way. So don’t ever let lack of knowledge or contacts stop you moving forwards. Nurture your network! P.s There is a video of Phil being interviewed by Property Tribes that you might be interested to watch. Jane Skynner is a property developer specializing in eco-friendly family homes in S. W. London. Jane is always delighted to hear from fellow property developers and anyone interested in JV’ing or investing in her projects. Posted in Blog, Networking by jane skynner / January 25th, 2012 / Comments Off on Nurture your network!